The Tesco Connect is not as well-known as its Android alter ego, the Hudl, but it is a great introduction to Windows should you want to get a tablet. 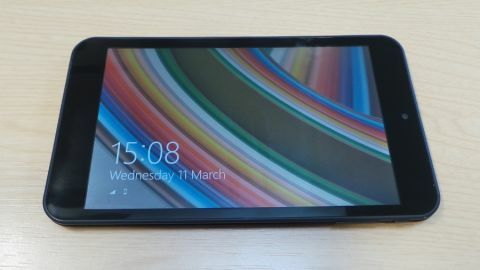 To TechRadar regulars, the Tesco Connect tablet may well bring with it a sense of deja-vu, mainly because Tesco's latest own-brand tablet is almost a carbon copy of the Linx 7 that I reviewed weeks ago. Tesco's Windows tablet comes with a power adaptor, a few leaflets, a micro-USB to USB adaptor and a USB cable. Externally, you would mistake it for one of the slew of anonymous Android tablets on the market. Oddly enough, it doesn't carry the same branding as Tesco's other high profile, Android-based tablet, the Hudl. In fact, it doesn't even carry any Tesco logo; there's a big Intel Inside logo on the back, but other than that, you will be hard pressed to find any other brand. As expected, Tesco plumped for a commonly used Intel reference tablet design for the Connect tablet. There's 1GB of RAM, 32GB on-board storage, Wi-Fi, a 7-inch display with a 1280 x 800 pixel resolution, Bluetooth 4.0 and the ubiquitous Intel Atom Z3735G processor clocked at 1.33GHz. Looking at its screen in portrait mode (which is how it should be used), the Connect sports a front-facing 2-megapixel camera dead in the middle at the top of the bezel, next to a status LED. On the right is the power button as well as the volume. On the top edge, from left to right are the microphone, a micro-USB port, a microSD slot, a micro-HDMI port, a headphone socket and finally the compulsory Windows button. There's a single speaker located on the opposite edge and a 2-megapixel camera at the back. That matches the exact layout of the Linx 7 tablet. The only difference is the material of the tablet's casing – it's shiny hard plastic on the latter, slightly matte and rubbery on the Connect. The tablet is solidly built with all the ports located where one expects them to be. Having two buttons with the same shape can be confusing, though. The screen has decent viewing angles but there is a noticeable gap between the glass overlay and the actual LCD panel which is distracting to say the least. There's no visible bleed and the colours are uniformly rendered across the display. The camera is what you'd expect from an entry-level model; sub-par, usable only in a well-lit environment. I would prefer to have a front-facing camera with a lower pixel count and one at the back with a higher pixel count given the same bill-of-material budget. The 7-inch form factor has carved a niche for itself in the tablet world and is a firm favourite amongst entry-level, affordable tablets, either on Windows or Android. You can easily handle the Connect with one hand but Microsoft's Windows 8.1 doesn't lend itself to that mode of operation, not unless you swap the desktop UI for the tile-based UI. Windows 10 should change all this hopefully and will be available to the Connect and other similar tablets as a free update when it launches later this year. You wouldn't expect the Connect to be used for anything resource-hungry – even web browsing should be kept to a few tabs only. It performed in line with other tablets based on the same blueprint. The tablet would not run the 3DMark benchmark in its entirety and it caused the tablet to restart. It scored 1040, 1468 and 811 points respectively on PCMark 8 Home, Work and Creative benchmarks. These are on par with other similar devices and tablets powered by Intel's Z3735G Atom processor. Battery life came in as a big disappointment, reaching just under three hours in our gruelling test. In fairness, it is likely that real life figures will be higher. Other than the fact that it runs Windows 8.1 with Bing and comes with a one-year subscription to Office 365 Personal for just £69 (down from the original SRP of £99) at the time of publication, the Tesco Connect is a tantalising entry-level desktop replacement option, especially if you already have a Bluetooth keyboard and mouse, and a spare monitor equipped with an HDMI port (you could even use your television).